For today’s World of Gin review we shall nip across to the Netherlands and look at Sloanes’ Gin. Some of you may be familiar with the name as it recently was awarded “Best Un-aged White Spirit” and “Best Gin” at the San Francisco World Spirits Competition 2011. 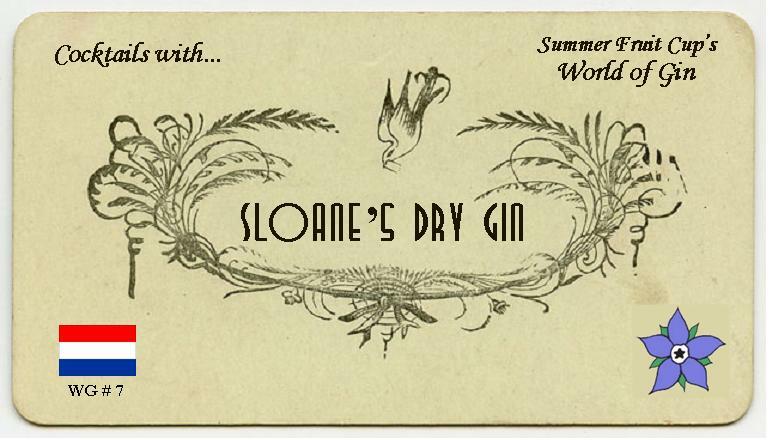 Sloane’s is described as a Dry Gin and is a little different to many other gins that are produced. Each of the ten botanicals are distilled individually* and then are later blended together to give a better balance to the overall flavour. In addition, the citrus botanicals (lemon & orange) are left to macerate in the spirit for 24 hours before being distilled; it is suggested that this increases the crispness and freshness of the flavour. Because of this method of the production, it cannot be called “London Dry”, but, as long as it tastes good, I don’t think that that really matters. Sloane’s Gin is distilled and bottled by Toorank distillers in the Netherlands and is 40% ABV. There is a bit of a history behind the name on the bottle: it is named after Sir Henry Sloane, the noted scientist from the 17th and 18th century. It is the very same man that Sloane Square in London is named after. Sir Henry had a very large collection of botanicals that he had collected on his travels, which were later donated to the British and Natural History Museums. This was inspiration to Sloane’s master distiller. Toorank suggest that it likely that Sir Henry introduced the UK to many of the staple gin botanicals of the day, such as angelica, cardamon, orris root, coriander and citrus fruit and so, inadvertently, he made a significant contribution to gin. Nose: Strong juniper, some spice and a touch of creamy vanilla. Reminds me somewhat of Plymouth Gin. Taste: Soft at the start, before moving to a strong juniper flavour with some coriander and angelica. There is certainly some citrus there, but it is not overwhelming. This is a classic style of gin with a subtle sweet twist. Flavourful elements of citrus and cardamon, really fresh, refreshing and very tasty. No garnish need with this one. Clean and very crisp. Juniper and some herbal elements are the predominant flavours. This cocktail works well with a lemon twist. Rather delicious – an excellent Martini. Quite cooling; the juniper comes through well and it’s a good thirst quencher. Rather delicate, with notes of juniper and cardamon. It’s not too sweet or too tart, and is quite light. Delicious. Intense and a touch on the bitter side. Although the gin comes through, it is a little overtaken by the Campari. It’s been a while since I’ve had a Bramble, but this was a great way to return to this modern classic. All of the flavours are in balance and the whole is certainly greater than the sum of the parts. Rather nice; there’s a little muskiness form the juniper, but the gin is proudly displayed. Nice and sweet towards the end, with a dry finish. A pretty classic Milano: not breath-taking, but sound. Some citrus; very similar to Pimm’s, actually. Although the flavour of the gin isn’t prominent, this is a drink that I’d certainly recommend. I really enjoyed Sloane’s Gin and, at less than £30 for a bottle, I think it’s well worth seeking out. The awards it has won are testament to the fact that the classic gin style is often the best. Cocktail highlights were the Gin & Tonic, Martini and Gimlet. Sloane’s Dry Gin is available for £26.95 for 70cl from Gerry’s. *This is certainly rare, but there are two other producers, that I know of, that use the same technique: Sacred of London and Moore’s of Australia. This entry was posted in World of Gin and tagged Best Gin 2011, Blended Gin, Sloane's Dry Gin, Sloane's Gin, Toorank gin by DTS. Bookmark the permalink. What Vermouth do you use for your gin-testing martinis? Hey Sam, Thank you for the kind compliments, glad you like the site. I use Dolin Dry for the Martinis although I have used Noilly Prat in the past. Well this weekend will be my first martini as part of a tasting of Adnams First Rate Gin. I have bought a bottle of Dolin Dry for this so I’m glad it’s approved by you!